Online Booking: Reservations may be made in advance for tour dates beginning April 1st. For March tour dates, reservations will be offered on a first-come, first-served basis. 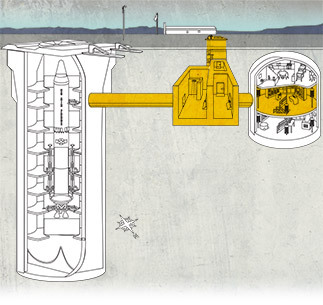 On this tour, you’ll descend 35 feet into the underground missile complex. You’ll visit the launch control center and experience a simulated launch of the missile. Then you’ll journey down the cableway to level 2 of the missile silo to get an up-close look at the Titan II missile itself. Finally, you’ll stand on top of the launch duct and look down on the Titan II missile from above. This tour is handicapped accessible. See the Accessibility page for important information if you have a mobility impairment or cannot ascend and descend 55 stair steps. For the daily one-hour guided tours , an elevator is usually available to access the underground portion of the missile site for those who have limited mobility or who need special assistance. The elevator has limited capacity and we encourage those who need the elevator to reserve its use in advance. Click here or call (520) 625-7736 to reserve your spot on the elevator for your tour. The elevator may only make one trip underground per tour. Walkers, wheelchairs and scooters may further limit the number of people who can use the elevator on a tour. Tour operators and others arranging group tours must know how many people in the group will require the elevator and whether they will be using walkers, wheelchairs or scooters when they call to make their reservation. Parents carrying babies or with small children 4 and under must also use the elevator. You are encouraged to book online or call the museum and reserve the elevator in advance. The museum does not provide wheelchairs. If you need a wheelchair or scooter, please bring one with you. Beyond the Blast Door, Director’s Tours and Top-to-Bottom Tours are not handicapped accessible. For our family visitors with young children, one adult chaperon is required for every 2 children in your group who is 5 years old or younger. Baby “backpacks” and back slings cannot be used – babies and children must be carried in front. While on the tour, children who are old enough to walk but who are 5 years old or younger must hold the hand of an adult. Parents carrying babies or with small children 4 and under must use the elevator. You can reserve the elevator in advance. See the link to the Accessibility page below. Walking shoes are required (no heels or flip flops please). Non-commercial photography and video recording are permitted, although flash photography is prohibited. Commercial photography is not allowed without written permission. To arrange a commercial photo or video recording session, please contact the Museum Director at [email protected].